Patrick Leake has taken over from Tom Cornwell as the President of the Cranleigh Rotary Club for 2016-2017. The change-over took place at a club meeting on 30 June. Patrick previously served as Club President in 2004-2005, but he acknowledges that much has changed in Rotary and the world about us since then. 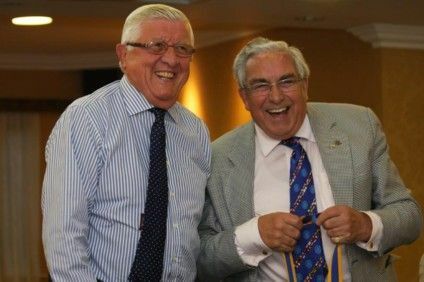 "My objectives for the year are to continue serving the community, support the Rotary District team and our chosen charities, and increase the profile and membership of the Cranleigh Club. It is fitting that for the year 2016/17 the Rotary International theme will be ROTARY SERVING HUMANITY - because that is what we do best. * The breadth of experience in the Club and the work the members undertook within the community and further afield. "I am pleased to say those things still apply. However, I would like to more people to become involved with Rotary, and there will be many meetings and opportunities when we shall be seeking to invite friends, acquaintances or neighbours to join us to help out at events - the more new faces the better. "During my year we will continue to encourage people to join the Club. We shall also explore new areas of outreach, such as social media and corporate membership. "We must also publicise the great contributions of Rotary International toward the global eradication of polio, and we have recently agreed to go ahead with PURPLE FOR POLIO, a drive to promote our campaign by supporting the planting of 5,000 bulbs in Cranleigh. I shall also be supporting two particular charities during my year in office, Water Aid and Virtual Doctors." Photo caption: Incoming President Patrick Leake (left) with last year's President, Tom Cornwell.